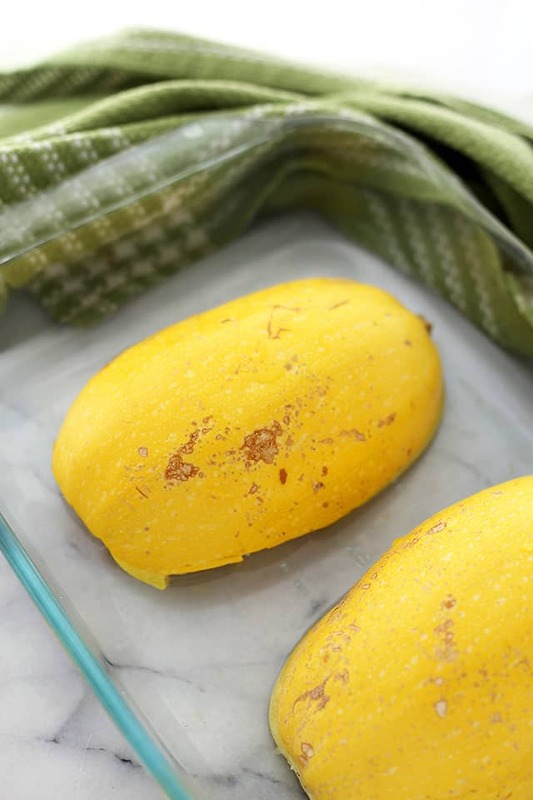 How to Cook Spaghetti Squash in the Microwave – A faster, mess-free method to cook spaghetti squash! Don’t you just LOOOOVE a good kitchen hack?!? This is one of the best! If you cook spaghetti squash at home on the reg, your life is about to change. As someone who tries to play numerous of roles in one day, I am always looking for shortcuts. Between running a business, a household, soccer practices, dance practices, sports games… AND mediating fights between my little girls over Elsa dolls AND screaming matches over frilly dresses?!? All faster routes are much appreciated. Also? I could go on about all the things on this darn to-do list, but I get overwhelmed when I start to name off all that needs to be done. SO, because of these wonderfully tiring reasons, I am forever grateful when I find a shortcut that will save me a few minutes wherever possible. 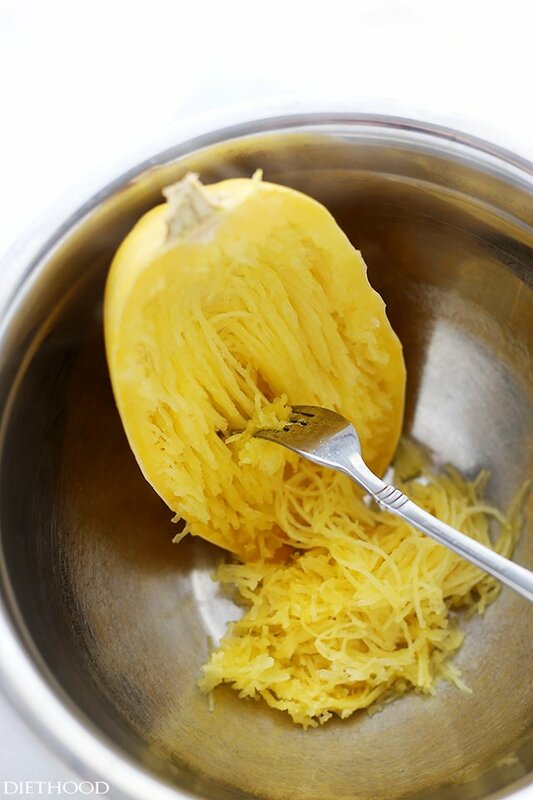 Therefore, using your microwave to cook spaghetti squash will result in a faster cook-time and longer strands. Tried and true. IMHO! For starters, you will of course need spaghetti squash, a bit of water, and a glass baking dish. Wash the outside of the squash, then slice it lengthwise and scrape out the seeds. I don’t look forward to cutting the squash in half because it’s a tough squash to cut, but a good knife always makes it easier. I’ve tried the method of piercing the squash and cooking it whole in the microwave, but I did not get the results that I was looking for. 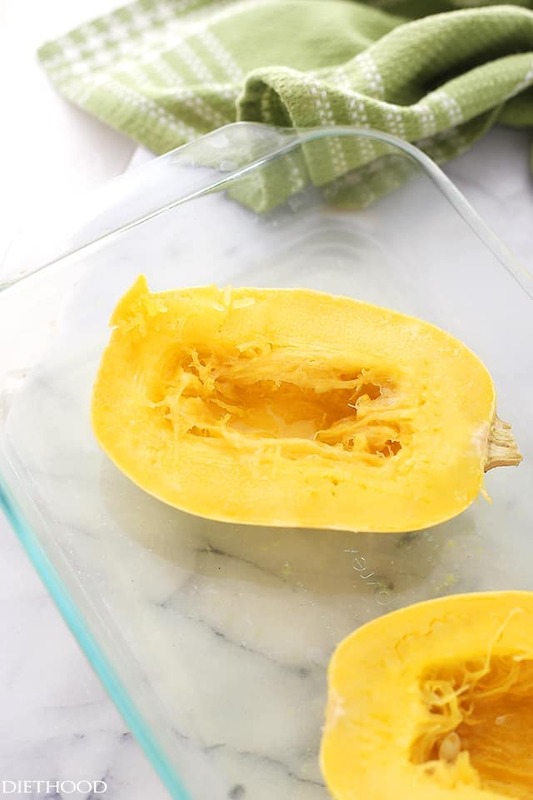 The method I am going to show you here was, in my opinion, the easiest and it gave me what I was needed – perfectly cooked squash, longer strands, and the whole faster-cooking thingamajig. Next, you want to put the squash, face down, in a 9×13 glass baking dish. Fill the dish with about an inch of water and microwave the squash for 15 minutes. Check to see if the squash is soft enough – it may need 3 to 5 more minutes to cook. The squash will be steaming hot – be careful when removing from microwave. Give it a few minutes to cool then, take a fork and peel away the spaghetti strands. That’s all folks! 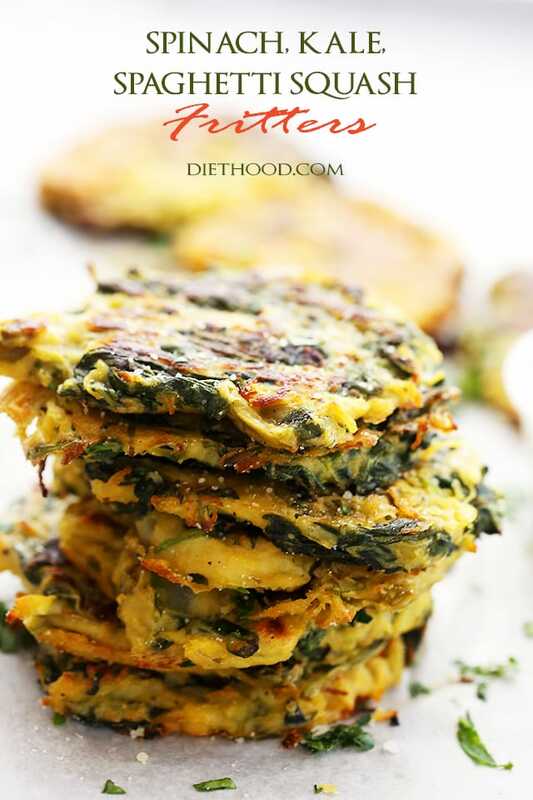 IF you’re looking for a seriously good recipe to try with your new hack, please hop over to these awesomely delicious Spinach, Kale, and Spaghetti Squash Fritters. 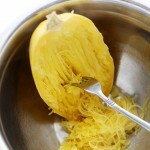 A faster, mess-free method to cook spaghetti squash! Wash the outside of the squash, then slice it lengthwise and scrape out the seeds. Next, place the squash face down in a 9x13 glass baking dish. Microwave the squash on HIGH for 15 minutes; check to see if the squash is soft enough. If not thoroughly cooked, microwave for 5 more minutes. Carefully remove squash from microwave and let stand few minutes. Take a fork and peel the spaghetti strands. Use it in your favorite squash recipes or serve it with your favorite pasta sauce and a sprinkle of parmesan cheese. I’ve cooked spaghetti squash in the microwave many times. Pierce it with a fork several times and cook 3 to 4 minutes and it makes it easier to cut in half. Hi Peggy! Thanks SO much for that tip! What?? Did not even cross my mind. I use my microwave as a breadbox. 🙂 I will try this!! What a time saver. Say what? I am so going to try this Kate! ‘Cause sometimes the microwave is our friend. :o). And what a great trick to making this delicious squash! I don’t own a microwave but my mother-in-law makes spaghetti squash all the time, I’ll pass this along to her!! Great idea!